This vacant building needed to be reconfigured so it could be rented. Yet the presence of underground toxic solvents meant no financing was available for purchase, construction, and environmental clean-up. The indemnification agreement exposed MSH Group to significant liabilities. MSH Group purchased this building and rebuilt it with cash. Although the building is fully rented, the environmental problem prevents the refinancing of the site. An LLC was formed to hold the site and a Pollution Legal Liability policy was purchased from AIG Insurance to provide coverage for bodily Injury and dimunition in value exposure. MSH Group rebuilt and subdivided a 67,000 square foot concrete block building in Richmond, California, into small industrial spaces. Roll-up up doors permit access to each space and the building is fully compliant with all landscaping and planning requirements. The well-lit site has a 37-car gated parking lot. A 80KW photovoltaic solar system produces 100% of the electricity consumed at the building annually— an economic benefit to our tenants and a significant contribution to the development of alternative energy systems in its region. A web-based monitoring system enables day by day analysis of this system. 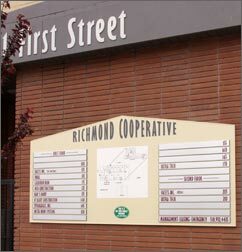 In its former life, the Richmond Cooperative was home for a manufacturer of motor control devices and valves. The company, known as AMOT, was Richmond's fifth largest employer when it was bought by Roper Industries. The conglomerate, however, moved operations to Mexico in 2004. The site went up for sale. Because of years of industrial use and the suspicion of subsurface groundwater contamination, the buyer was required to sign an indemnifacation agreement, shielding the seller from environmental liability. After an inspection revealing some contamination, MSH Group negotiated a price that reflected the environmental engineering report and the estimated remediation costs. MSH has now assumed environmental liabilities and is in voluntary compliance with a cleanup agreement with the Department of Toxic Substance Control.